Belfast based Photographer and DoP, Alasdair McBroom talks about his experience of the Rotolight ANOVA V2 that he used to light his latest projects working along side Director / Writer Stuart Drennan (Hollyoaks, BBC, Channel 4) for their TV and Film Production Company, Wolfhound Media. The Rotolight Anova V2s came to me quite by accident, and in hindsight its one of those accidents that you end up really appreciating. I was in the market for two LED panels and wanted to spend quite a bit buying one and not having to deal with less reliable equipment. I had quite blindly settled on one brand in particular, but when I found out just how long it would take to get them I thought it was time to start looking at options. Thanks entirely go to Danny from CVP in Scotland for taking the time to explain what was available and their relative pros and cons. After reading his suggestions, the Anovas just jumped out at me. I purchased two panels, a 110 and a 50 Bi Colour V2. McBroom has worked on a wide range of projects within TV and Film for the likes of BBC 3, BBC Belfast, the Telegraph and British Airways, including a variety of feature films, commercials and Bollywood movies also accredited to his C.V. I should say that I am a relatively new convert to film and video, only starting to work as a DoP about five years ago. My history is as a stills photographer, but now my work is split about fifty-fifty as a DoP and a photographer. Both are as challenging as each other and as always, without the right lighting, you struggle. The first big test for the Anovas was a short film called The Wait that was set in one location. The problem was that the lights were going to have to be out of reach due to a fairly technical camera move. This is where the battery power and the wireless control of the Anovas came into its own. They performed exactly as they should and after the initial setup I didnt have to think about them again. Being able to put the actors in place and modify the lighting on the fly was just great. The Rotolight ANOVAs Wireless control via the Rotolight Magic Eye iPhone/iPad app (latest upgrade now available) and V-Lock battery mount comes as standard and can be powered for upto 4 hours continuously at full power. An eco-friendly LED Lamp, the ANOVA V2 draws just 38W emitting upto 3.9Kw equivalent output. My next job was a music video for a band from Belfast called The Jepettos. They had provided music for a short film called An Actor Prepares that our production company had made at the end of 2013. The trick for me as a DoP was matching the footage from the short to the new footage that was shot six months later in the same location. Using a few Dedolight 150Ws to provide the same colour temp and feel as the original short, I was able to slip in the Bi Colour Anovas to act as soft key and fill lights on the actors. We had about 20 extras involved so one of the challenges was keeping the place free from cables. Step in the battery powered Anovas. I could lift them and move them without having to worry about looking for new power sockets and without having to always be on the lookout for cables being in the way. The speed of this saved us a lot of time in setup and created a lot more shooting time. The Anovas came along for my first chance to do something with stills in the form of a fashion shoot. The shoot was based around the concept of The Little Black Dress - I just love the quality of light from the 110 degree ANOVA, using it as a soft key light and the 50 as a rear with a Dedolight 150W for the background. 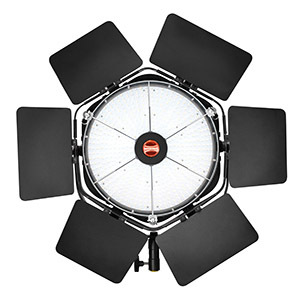 What I really have come to love about the Rotolight Anova Bi-Colour LEDs are all the things that Rotolight as a company have introduced - wireless control, battery power, portability and of course the very accurate colour rendition and quality of light. I will be using them quite regularly in the future and see an expansion to more units when the need arises.